Universal Home Theatre can now provide you with a realistic and mystical star light cinema experience by offering an exciting custom home cinema solution that will be the envy of many friends and family. 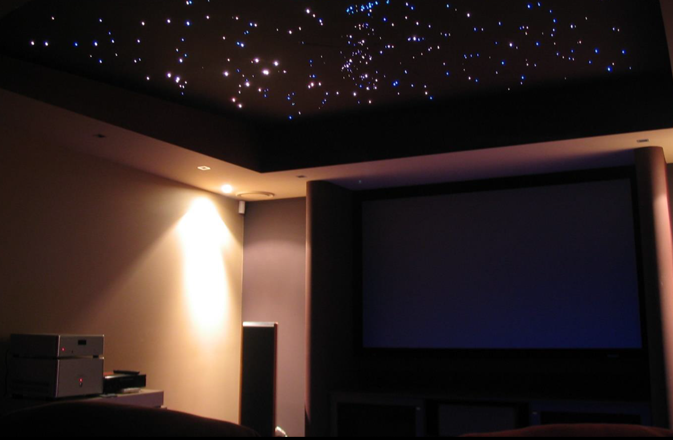 A starlight cinema ceiling can also assist in opening up the feel of the room engulfing you in a serene, calming, and mesmerising atmosphere. Ideal for all theatres, gaming rooms, reception halls and bedrooms. Star light ceilings are a fantastic addition to any home that can be fully installed at a reasonable cost. We can customise it to your application and work with you in creating a feature in the home that will WOW the neighbours, entertain guests, and even add value to your property. In addition to this Universal Home Theatre is happy to offer LED Step-Up Lighting as an additional option to add to a home theatre application. These LED strips can also be used in commercial applications, as well as residential. Home Theatre Systems If you have simply purchased some home entertainment components and wish to have the system installed and set up to the best of its ability, we can provide expert integration and will thoroughly demonstrate your new system upon completion of home theatre installation. If you are moving house and are worried about the way your home theatre systems are connected and/or the safe transport of your audio visual components, Universal can provide expert removal and re-installation of all your audio visual components. If you’re looking for a quote please use our contact form, alternatively call us on 1800 144 199 Our professional technicians service all areas of BRISBANE, MELBOURNE, SYDNEY, ADELAIDE, GOLD COAST.